After my recent look at QNAP's 10 GbE-capable TS-431X, I decided to continue the 10GbE theme. This time it's Synology's DS1517+ DiskStation, targeted at the Workgroup/Small & Medium business market. Part of Synology's "Plus" series, the DS1517+ replaces the DS1515+. It features five drive bays, four Gigabit Ethernet ports, four USB 3.0 ports and two eSATA ports. 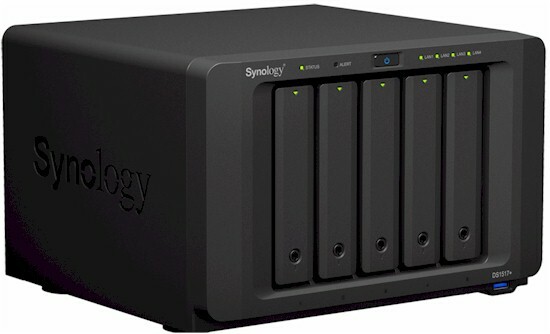 It's a step-up alternative to the DS1515, which is the five-bay member of Synology's "Value" series. The DS1515 also has a quad-core CPU (Annapurna Labs Alpine AL-314 @ 1.4 GHz), but a fixed 2 GB complement of RAM and no ability to add M.2 cache or 10 GbE. Check Synology's full comparison for more details. The main difference between the DS1515+ and DS1517+ is the latter's PCIe expansion slot that enables installing a single or dual port 10 GbE card or dual M.2 card. The latter adds the capability of SSD (Solid State Drive) caching for improved performance without using up drive bay slots, where 2.5" SSD drives can also be configured for caching. Synology has an interesting white paper that describes the benefits of SSD caching that's well worth reading if you're trying to eke out the maximum performance from your NAS. You can buy the DS1517+ with 2 or 8 GB of DDR3 RAM installed at MSRPs of $699.99 and $799.99, respectively. Synology sent the 8 GB configuration for review. For this review, I'll be comparing the DS1517+ with QNAP's TS-563-8G. Like the DS1517+, the TS-563-8G is targeted to the SMB-middle range market. Both NASes have five bays, are 10 GbE capable with the addition of an optional PCIe 10GbE NIC and support capacity expansion by using additional storage cabinets. The chart below, generated from our NAS Finder, shows a top level comparison between the two NASes. Both of the units were tested with 8 GB of RAM, and both can be increased to 16 GB. The DS1517+ has four Gigabit Ethernet ports, compared to two on the TS-563-8G and has four USB 3.0 ports, compared the to QNAP's five. You can look at a complete features comparison here. The callouts below show the front and rear panel of the DS1517+. There's a single USB 3.0 port on the front panel. The port is easy to miss; you need to get down to table level to see it. The rear panel has four Gigabit Ethernet ports, PCIe Expansion slot, three additional USB 3.0 ports and two eSATA ports for connecting Synology expansion cabinets. You can also attach a single eSATA external drive for backup. Synology's specs clearly state a 2.4 GHz quad-core Intel Atom C2538 runs the show. Since the DS1517+ proved to be too difficult to disassemble to get a good main board photo, we know little else about its innards. So the data in the key component summary table is pretty sparse. We were able to identify the board supplying the 10GbE SFP+ port as Synology's E10G17-F2. This is a Mellanox ConnectX-3 Pro EN MCX312B-XCCS, which is the same as a Mellanox ConnectX-3 Pro EN MCX312B-XCCT with the short bracket factory-mounted. Amazon was showing $280 for Synology's card and $251 for Mellanox'. Either way your total cost for an 8 GB DS1517+ with 10GbE will be over $1000. According to the hardware installation guide, memory expansion via a removable panel on the bottom cover is fairly simple as described below. Accessing the PCIe slot is relatively easy, too, but requires removing the main cabinet cover. Memory configurations are 2 GB (1 x 2 GB) and 8 GB (2 x 4 GB). So you'll end up with spare RAM if you move up to maximum RAM. Power consumption with four WD Red 1TB (WD10EFRX) drives we provided was 38W with drives spun up and 26W with drives spun down. Fan and drive noise was rated as Medium (mostly fan noise). RAID 5 rebuild for a 4X1TB volume was ~ 2hour and 45 minutes. As with all current Synology products, the DS1517+ runs Synology's DiskStation Manager DSM Version 6.1. You can download the comprehensive DSM 6.1 user's guide here. The data sheet for the DS1517+ will give you a good overview of its features and how it differs from some of the other Synology NASes. If you want to take the user interface for a spin, Synology's online demo will let you check out many, but not all of the features. The screenshot below shows the DSM 6.1 landing page with the Control Panel opened and several desktop widgets active. Firmware version DSM 6.1.1-15101 was loaded onto the DS1517+ and performance tests were run using the Revision 5 NAS test process. All tests were run using Western Digital Red 1 TB (WD10EFRX) (x4 SNB supplied). Synology shipped the NAS with three 8 TB Seagate IronWolf NAS drives (ST8000VN0022). For consistency with other tested NASes, we removed those drives and replaced them with our standard four Western Digital Red 1 TB (WD10EFRX) drives. However, as the Synology DSM 6.1 data sheet indicates, the DSM Storage Manager now supports Seagate's IronWolf Health Management. We ran the 10 GbE Performance tests using our standard 10Gtek x520DAI card with the Intel 3.9.58.9101 driver. The default BTRFS filesystem was used for all volume builds. EXT 4 is also supported. Backup has been removed from the base OS. Hyper Backup was installed from the Synology Package Center and used for the network (rsync) and attached backup tests. The Local Data Copy and Remote Data Copy options were used, not the "Local shared folder & External Storage" and "Remote rsync Server". Testing showed using the latter options drastically reduced backup speed. As we've pointed out in many reviews, NAS performance is often limited not by the ability of the NAS to handle a heavy load, but rather the limit of Gigabit Ethernet and a single client. Both of the quad-core NASes used in this comparison are able to easily saturate a single Gigabit Ethernet client connection with File Copy Read and Write tests results between 109 and 110 MB/s. If you want to break the 1-gigabit barrier, you need to use multiple clients, enable link aggregation on the NAS ports and connect through a switch that also supports link aggregation. Or you need to move to 10 GbE. Although 10 GbE will cost more for both NAS and client, this method supports higher throughput with a single client with no link aggregation required. So we'll focus our performance review on 10 GbE performance. To get a feel for how the eight 10 GbE products in our charts performed, I created a chart for 10 GbE RAID 5 File Copy Write and 10 GbE RAID 5 File Copy read. For RAID 5 File Copy Write, the DS1517+ was second behind the Thecus N7770-10G. It was 37.8 MB/s slower than the Thecus, but was 81.4 MB/s faster than the number six TS-563-8G. As we've seen in other 10 GbE reviews, for RAID 5 File Copy Read, the QNAP TS-563-8G outperformed all other NASes by a significant amount. The benchmark summary composite chart below shows only 10 GbE test results run using a single 10 GbE client. If you want to see the complete results including the Gigabit Ethernet tests, you can click here for the DS1517+ or here for TS-563-8G results. Looking at the chart, you can see that for File Copy Write performance, the Synology DS1517+ outperformed the TS-563-8G for RAID 5 and RAID 10. But for File Copy Read, the TS563-8X has the highest throughput we've seen and outperformed the DS1517+ for all RAID levels tested. In general, the both NASes turned in similar scores on the NASPT tests with the Synology having a slight edge for write-related tests, and the QNAP having an edge for read-related tests. Starting with the previous review of the QNAP TS-431X, the NAS Ranker has a new RAID5 10 GbE class. Prior to that review, the NAS Ranker did not take into account 10 GbE performance. The NAS Ranker now takes 10 GbE performance into consideration when calculating NAS Ranks. Since there are only eight NASes that have been tested with 10 GbE, I decided to leave the results sorted by Rank. The NAS Ranker shows that the Synology DS1517+ has grabbed our #1 ranking knocking the previous #1 ranked NETGEAR RN626X down to #2. Turning to the Ranker Performance Summary, you'll find that there's lots of data in the composite chart below. Looking first at the Gigabit Ethernet results near the top of the chart, the Synology DS1517+ outperformed the TS-583-8G in every category. For the 10 GbE category rankings, the Synology DS1517+ had category wins for the10 GbE Write and Mixed Read Write categories. The QNAP TS-563-8G, not surprisingly, won the Read category as well as the Video Catetgory. The two NASes tied in the 10 GbE iSCSI category. When deciding which of these products best meets your needs, factors other than performance or price may come into play. As we saw with the 10 GbE Ranker performance summary, each had category performance wins, but none of the wins were by a significant amount. Each win or loss was separated by just one ranking. For those looking for massive amounts of storage, the TS-563 offers more expansion options and capacity. The TS-563 is compatible with the UX-500P five-bay expansion cabinet or the UX-800P eight-bay expansion cabinet. The TS-563 can support up to two of either bringing the total number of supported bays to 21 or 168TB of raw capacity. The QNAP expansion bays use USB 3.0 to connect. The Synology DS1517+ supports two DX517 five-bay expansion cabinets for a total of 15 bays or 120TB 150 TB of raw capacity with 10 TB drives. The DS1517+ connects to the DX517 expansion cabinets using eSATA. Both NASes offer expansion via a PCIe slot. The slot on the QNAP NAS is limited to a single or dual port 10 GbE card, and only QNAP's card is compatible with the NAS. Synology has an expanded list of compatible 10 GbE cards as well as a dual M.2 SSD card that supports SSD read-only or read-write caching. Though beyond the scope of our testing, Synology claims that depending on the type of work being done, SSD caching can boost service performance by 2.7X. Other features buried inside the QNAP QTS or the Synology DSM operating systems might also be the deciding factors that influence your purchase decision such as support for virtualization, ease and management of disk groups and RAID groups and centralized management. For me, the snapshot capability found in the BTRFS file system on the DS1517+ would be a deciding factor in my decision. Based on performance, and especially the strong performance on Gigabit tests, it's easy to see how the DS1517+ is the new #1 Ranked 10 GbE-capable NAS.